Trying to figure out what type of team the Dodgers are is about as hard as trying to keep Lindsay Lohan from getting drunk. 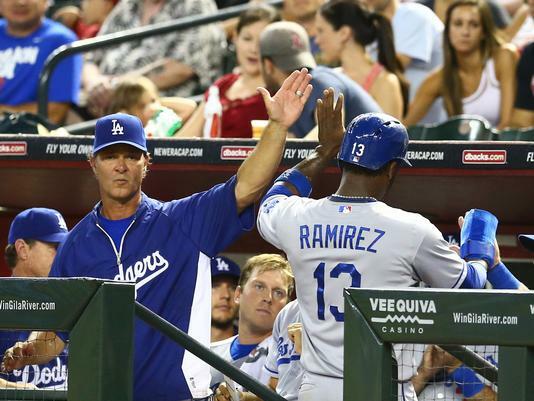 The Dodgers were just 30-42 after 74 games, and in last place in the NL West. However, they went on to win 17 of their next 22 games, to even their record at 47-47, and are now just 2.5 games behind Arizona for first place in the division. So is the glass half full or half empty? It’s fair to say that with a $209 million payroll, LA has underachieved. If you have the highest payroll in baseball, you shouldn’t be a .500 team. If you have a $200 million payroll, you should probably have a closer that doesn’t wet the bed every night, and some consistency on the left side of your infield. More importantly, Matt Kemp and Andre Ethier, two of the teams highest paid players, should be hitting the ball out of the ballpark. All of that has the makings of a team that is an expensive bust. Then again, injuries have slowed the Dodgers down. Hanley Ramirez has spent half the season on the DL, Matt Kemp’s been on it twice, and even when he’s been in the lineup, he’s been ailing. Zach Greinke was a moron in San Diego, and spent nearly two months recovering from a broken collar bone. Carl Crawford has recently spent time on the DL, as have starting pitchers Chris Capuano and Ted Lilly. All of those things aside, since calling up Cuban phenom Yasiel Puig, the Dodgers have had the best record in the National League. Their re-surgence has not only coincided with Puig doing his best Bo Jackson impersonation, but also, with Ramirez, Greinke, and others getting healthier. Manager Don Mattingly also seems to have temporarily solved his bullpen issues by putting Kenley Jensen in that role, and exiling Brandon League to a remote desert island. Nearly every team in the NL West has made a run thus far. The D’Backs have been in first place for most of the season, but had one stretch where they lost 8 of 9, and their division lead over LA has shrunk from what was once 9.5 games. The Giants spent some time in first place early in the season, then dropped 14 of their next 16 games. The Rockies spent parts of April and May in first place, but came back to earth and are now 3 games under .500. The Padres went 33-21 over a 54 game stretch and were in 2nd place in the division, but have only won 4 of their last 22 games. In other words, the remaining 68 games figure to be crazier than Mr. Toads Wild Ride. With Puig in the fold, the Dodgers are definitely a different team. He has completely energized the entire ball club, and saved Don Mattingly’s job for the time being. LA has one of the best starting pitching staff’s in baseball, led by Clayton Kershaw, who has the lowest ERA in the game. Zach Greinke has looked very good of late, Hyun-Jin Ryu has been excellent for most of the season, and the newly acquired Ricky Nolasco looks reliable. The bullpen remains a question mark, but with Jansen closing and the recent emergence of Paco Rodriguez, the Dodgers relief core has been stabilized for now. The Boys in Blue seem like a good bet to make the playoffs at this point. They are only 2.5 games back in the division, and 5.5 games out of the wild card. If LA can remain reasonably healthy and Puig and Ramirez continue to tear it up, playing in October isn’t unreasonable. For $209 million, the Dodgers aren’t the most well balanced, and well constructed ball club. However, they can still become an elite team if Matt Kemp can get healthy again, and become the power hitter he was early last season. As for Andre Ethier, he may just end up being an expensive 4th outfielder, but it’s just money and the Dodgers have plenty of it. This entry was posted in Dodgers on July 18, 2013 by omzzzzz.